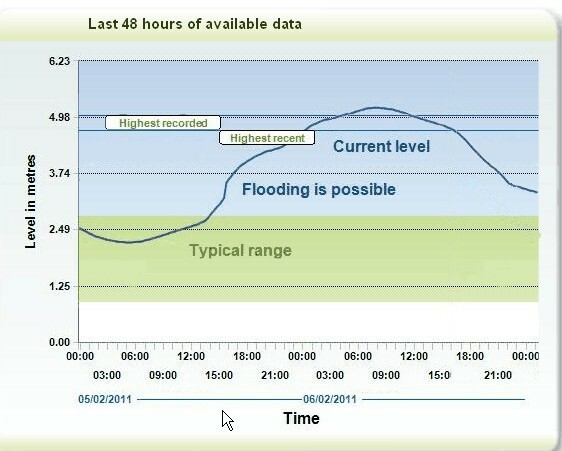 As technology develops, the opportunity exists to extend the approach to incorporate live data, thereby communicating transparently the beneficial consequence of high friction barriers; this principle is demonstrated by the figure below which shows live data streamed from a River Vyrnwy gauge during the recent high magnitude (c. Q50) event. Such predicative analysis, broadcast in real time, would help to demonstrate the connection between Flood Alleviation, River Basin Management and the Water Framework Directive, and satisfy ongoing interest in funding, modelling and pilot attenuation works. Within the aim of promoting wellbeing by scientific method credible to stakeholders lies the issue of communication. Since 2010, UK factual stage data has been streamed from many river gauges, but the streaming of a predictive model alongside such data may need to approach real-time ensure the audience who monitor the stage hydrographs of flood events feel confident with the model. The study suggests that this is technologically achievable through an optimized combination of the CFD model’s irregular mesh and computer capacity. This project sees opportunity in the developing technology of CUDA and SPH for prediction and communication. Whilst the CFD meshes adopted represent the terrain of the study site, they are not yet optimal. The study indicates that, for future research, there lies a point-cloud capable of yielding a computational mesh mapped to irregular terrain features. This would be standard for all researchers, credible to (and editable by) stakeholders and efficient for streamed communication. It is suggested that, provided such standardization is authoritative, it would be productive in terms not only of research time but also of the quality of river basin management.